Carry your handgun in your vehicle with this car holster. 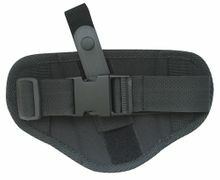 This nylon holster will fit most medium or so automatics and some revolvers. This is a gun holster with an adjustable strap to attach to some upright in your car between your front seats. You may want to ensure the floor below the holster is relatively clean since your barrel may be resting on it.